Guitar World presents the 10 coolest guitar instrumentals ever. Eric Gales and Gary Clark Jr. Team Up for "Boogie Man"
As anyone with YouTube access can attest,Eric Gales is a truly explosive guitarist—the kindwhose playing makes scores of other guitarists wonder what the hell they've been doing with their lives. Poll: Albert, B.B. or Freddie King — Who Is the Real “King” of the Blues? Jimmie Vaughan dishes out praise to his favorite guitarists, past and present. Today's Lick of the Day by Keith Wyatt at the Musicians Institute is a tribute to blues great Freddie King. Another gem from Freddie King, this time based on a Son House slide lick. 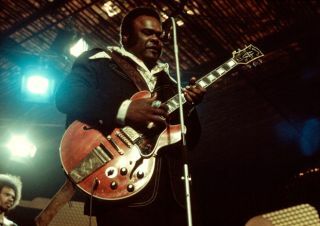 The true blue note in action--in today's lick of the day courtesy of the "Texas Cannonball", Freddie King.